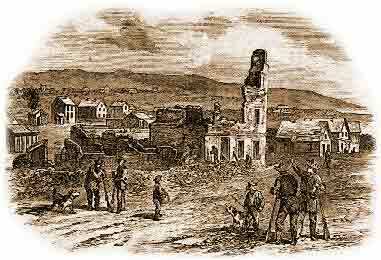 The Free State Hotel was left in ruins after the raid on Lawrence, Kansas in 1856. Lawrence was the center of Kansas's anti-slavery movement. It was named for Amos Lawrence, a New England financier who provided aid to anti-slavery farmers and settlers. This group went beyond simple monetary aid. New England Abolitionists shipped boxes of Sharps rifles, named "Beecher's Bibles," to anti-slavery forces. The name for the rifles came from a comment by Henry Ward Beecher, the anti-slavery preacher who had remarked that a rifle might be a more powerful moral agent on the Kansas plains than a Bible. The lines were now drawn. Each side had passion, and each side had guns. The 1856 raid on Lawrence wasn't the only time the city saw violence as a result of the slavery conflict. 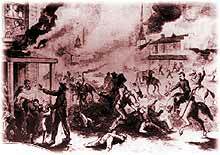 Notorious border ruffian, James Quantrill, led a raid on the city in 1863 left 150 men dead and over 200 buildings destroyed. The administration of President Franklin Pierce refused to step in to resolve the election dispute resulting from the "border ruffians." In the spring of 1856, Judge Samuel Lecompte demanded that members of the anti-slavery government in Kansas, called the Free-Soil government, be indicted for treason. Many leaders in this government lived in Lawrence. 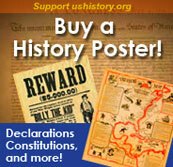 On May 21, 1856, the pro-slavery forces sprung into action. A posse of over 800 men from Kansas and Missouri rode to Lawrence to arrest members of the free state government. The citizens of Lawrence decided against resistance. However, the mob was not satisfied. They proceeded to destroy two newspaper offices as they threw the printing presses from the Free-Soil newspaper into the nearby river. They burned and looted homes and shops. As a final message to Abolitionists, they aimed their cannons at the Free State Hotel and smashed it into oblivion. 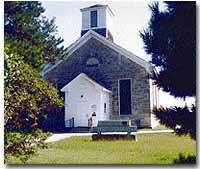 This church in Wabaunsee, Kansas was founded by members of the Beecher Bible and Rifle Colony. The attack inflamed almost everyone. Republicans introduced bills to bring Kansas into the Union under the free state government, while Democrats introduced bills to bring in Kansas as a slave state. Neither party alone could get the votes necessary to win. To increase readership, Republican newspapers exploited the situation in Kansas. Their attack galvanized the northern states like nothing before. It went beyond passing pro-slavery laws. The sack of Lawrence was a direct act of violent aggression by slave-owning southern "fire eaters." The Massachusetts Emigrant Aid Company offered to protect settlers headed to Kansas by sending them in organized groups to Lawerence, where the Company had built reception facilities. This Lawrence property also doubled as fortifications in case the Border Ruffians attacked. The Report and its supplementary documents are particularly striking in that they intertwine the idea of a farmer's paradise with the moral challenge of keeping slavery out of Kansas. Money for guns, called "Beecher's Bibles," was collected at church services all over the North.